Men, manhood, and what it means to be a man are under attack by radical feminists, homosexuals, and transgenders. They say men are obsolete and not needed anymore. They are doing their best to dismantle God's design and definition of manhood. These sexually confused say that manhood is toxic and traditional masculinity is harmful to society. Their approach is to delete offensive words that describe the male species such as him, he, male, men, and mankind. One writer said that hatred of women is innate and inescapable within men. The man is the key to biblical infrastructure in families, communities, and ultimately the nations. You have heard it said, “As it goes with the family, so goes it with the world.” It's time to kick the politically correct cult out of the home and put father back into the family. This book is about God's blueprint for power, purpose, and identity. There is a full-blown assault on what it means to be a man by radical feminists and transgender homosexuals. Some say masculinity is toxic and offensive and may hurt the feelings of some women, transgenders, and non-binary people. This attack is really against God’s design of man, woman, family, and ultimately society itself. God created the male and the female. There is no third gender. That’s a politically incorrect statement. Women are not men and can never be men. The gender wars have just begun, and Bible-believing Christians and men are in the way. The idea to create the male species was God’s idea. Man was created in the image of God and given spiritual authority to govern the Earth. This simple message of identity is offensive to cross-dressers, female impersonators, and the sexually confused. God created Adam as a king that would work and manage a kingdom. To understand work, you need to understand the first great commission of dominion. Kingship is a powerful truth. It’s a truth revealing the mandate and delegated ability to govern. When we speak of heaven, sometimes we are talking about a position, not a place. When you think of heaven as a spiritual position and not just a spiritual place it helps you view spiritual authority from a different perspective. Some women are trying to become men, and some men are trying to become women. There are significant differences between women and men. Sexuality, for example, is fundamentally biological and not socially constructed based on soulish attractions and amorous feelings. The woman was taken out of the man to minister to the needs of the man. This is a hard truth for the God haters and reprobates. The woman was designed by God to supply what the man lacked. This means it’s important to learn how the man and woman complement each other. In the garden of Eden, God fellowshipped with Adam spirit to spirit. This is an exciting truth because God first created an environment, an atmosphere, for the man to dwell. In this atmosphere, the man could fellowship and communicate with God. As a spirit-led man, Adam was assigned the task of tending the garden. This is called work. Names reveal identity and point toward purpose. And God said let there be, let there be, and let there be. If you only knew God from reading Genesis Chapter One, you would conclude that he is a voice with creative power.God needed to train Adam in the power of words. The serpent was hanging around the forbidden tree in the Garden of Eden, and one conversation resulted in the fall of man. Conversations have power and wrong conversations can destroy your life. Let’s review the devastation of sin on the relationship between the man and the woman. What you are about to read is the result of outright rebellion against God. Sin. Not only did Eve eat of the Tree of the Knowledge of Good and Evil, but she also gave to her husband, and he did eat. Homosexuals and transgenders say that manhood is toxic and traditional masculinity harmful to society. Their approach is to delete offensive words that describe the male species such as him, he, male, and men.One writer says that hatred of women is innate and inescapable within men. A tactic is a plan of action for attaining a goal. Satan has one intent, to steal, kill and destroy. Many Christians are interested in spiritual warfare strategies dealing with principalities and powers, territorial spirits, and demons. There was a time when the man went off to work, he was the breadwinner, and the woman stayed home nurturing the children. Not so much anymore. It was easier then to define the man and women’s role. It’s not as easy today because the roles are not as clear-cut. Men have needs. One is born a male but must become a man. Manhood requires that specific needs be met that helps the male mature. To mature requires the man to admit he needs help, accept the need for help, and admit that he doesn’t know everything. Finding the right spouse is a glorious thing. The Bible describes the characteristics of a virtuous woman. Virtue is the quality of doing what is right and avoiding what is wrong. It is the character of moral excellence. God teaches to embrace the virtuous woman and avoid the loose woman. When men and women don’t understand the difference in one another, their relationships malfunction. Not only do they fail in their own lives but the lives of their children. Malfunctioning relationships manifest in many ways including divorce, family divides, fights among relatives, families that scatter, jailed children, and indifferent relationships. Men Going Their Own Way (MGTOW ) is about men giving up on serious romantic relationships with women, marriage, and starting a family. Some ask, “Where have all the good men gone?” The answer is, they are still around but watching from a distance. Some are just going their own way. 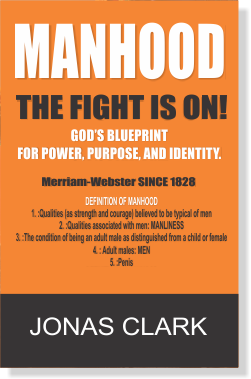 Click the button below to add the Manhood: The Fight Is On! God's blueprint for power, purpose, and identity. (Physical) to your wish list.